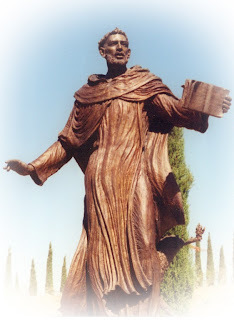 Our Dominican Order celebrates the Feast of St. Augustine because our founder, St. Dominic, was a Canon of St. Augustine before he was called by God to begin a new Order of Preachers. 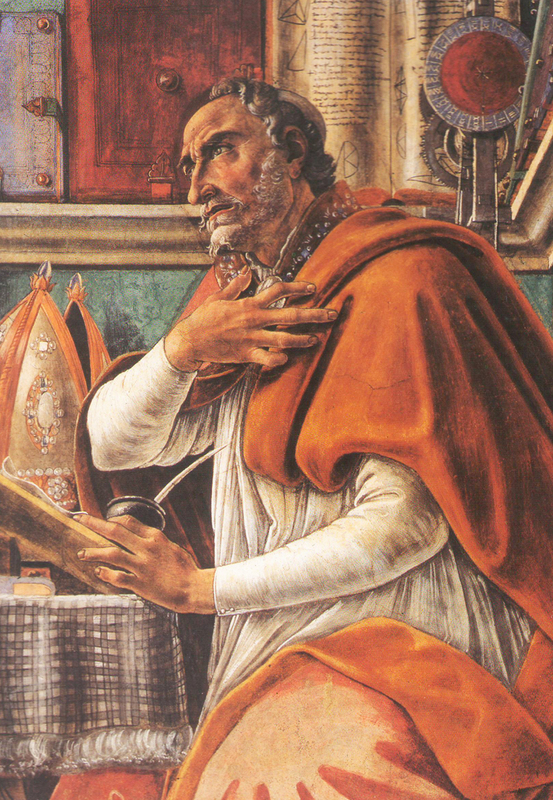 Since we call St. Dominic our Father, we lovingly refer to St. Augustine as our 'Grandfather' in faith. In his wonderful book of "Confessions", St. Augustine talks about the delights of community life as he knew it among the friends who gathered around him in a religious community. 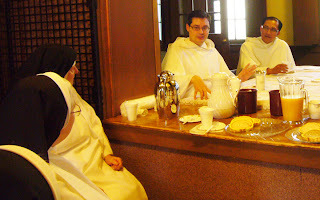 These delights are still ours today as we live the Dominican Monastic Life in the 21st Century. "The charms of talking and laughing together and kindly giving way to each other's wishes, reading elegantly written books together, sharing jokes and delighting to honor one another, disagreeing occasionally but without rancor, as a person might disagree with himself, and lending piquancy by that rare disagreement to our much more frequent accord. We would teach and learn from each other, sadly missing any who were absent and blithely welcoming them when they returned. Such signs of friendship sprang from the hearts of friends who loved and knew their love returned, signs to be read in smiles, words, glances and a thousand gracious gestures. So were sparks kindled and our minds were fused inseparably, out of many becoming one. " Father Joseph Do, OP was ordained in his home Vicariate in Vancouver, British Columbia in April of this year. We became friends with him when he was doing some of his studies for the Priesthood at St. Albert's House of Studies in Oakland, CA. During the time of his studies he came to visit us and even assisted our chaplain at the Vigil services on Holy Saturday, singing the beautiful "Exsultet" which praises the Lord for the long preparation for the Incarnation. And so after his Ordination, when he was give a time of vacation, he visited us, said Mass for us, gave us his First Priestly Blessing, and we had a delightful visit in the parlor. Father Joesph's companion on this visit was Father Ambrose Sigman, OP who was in his class at the House of Studies. Fr. 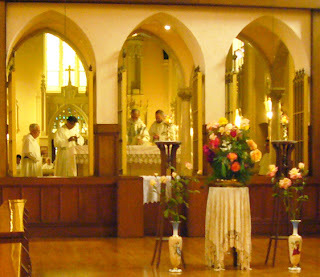 Ambrose is now serving at the parish of St. Raymond in Menlo Park. After his vacation, Fr. Joseph will serve at the parish of Our Lady of Lourdes in Houston, Texas. Thursday, August 8, was the feast of our founder, St. Dominic. This special occasion was celebrated with the Dominican priests from the new house of friars, St. Raymond's, here in Menlo Park. We had a beautiful concelebrated Mass with Fr. Xavier Lavagetto, OP as celebrant and homilist. Fr. Xavier is the new member of the campus ministry team at Stanford University. The other priests with him were Fr. Isaiah Mary Molano, OP, also of the Stanford campus ministry team; Fr. Eugene Sousa, OP, our chaplain; Fr. Christopher Fadok, OP, the new pastor at St. Raymond's; Fr. Ambrose Sigman, OP assistant pastor at St. Raymond's; and Fr. Patrick O'Neil, OP, director of Vallombrosa Retreat Center. After the Mass we had a delightful visit with the friars, learning about their ministries, their hopes, their plans and programs. In the Dominican Order, from the days of our founding in the 13th century, the nuns and the friars have always fostered a close family relationship. In his day St. Dominic very frequently visited the nuns and brought with him many of his brethren. Today we cherish our partnership in the evangelical mission of the Order, and the friars are very much a part of all of our celebrations. On a beautiful summer day this week our community was treated to a delightful visit with Sister Macrina Wiederkehr, OSB. 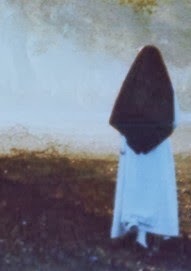 She was in the area to preach a retreat for women at the Vallombrosa Retreat Center just across the street from us. During that time she found a bit of free time for a social visit with us. It was very interesting to learn about her home monastery of St. Scholastica in Fort Smith, Arkansas. And her stories of retreats she has given made us praise God for working through her in bringing so many people to adore and love Him. The books she has written are many and beautiful. The latest is "Abide: Keeping Vigil with the Word of God". It is very helpful in drawing one into the depths of the words of Scripture and nourishing one's spiritual life on the banquet of God's Word, To learn more about Sister, her books and her retreats around the country, click here. We recently noticed a blog with some lovely pictures of our monastery and an account of a visit here. You can click on this link to enjoy this interesting blog.